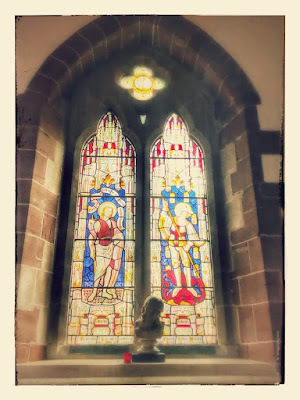 In recent days I have been writing about both the windows in Saint John’s Church, Wall, including the window by the Tractarian artist Charles Eamer Kempe, and about the celebrations of Saint George’s Day over the past few days. 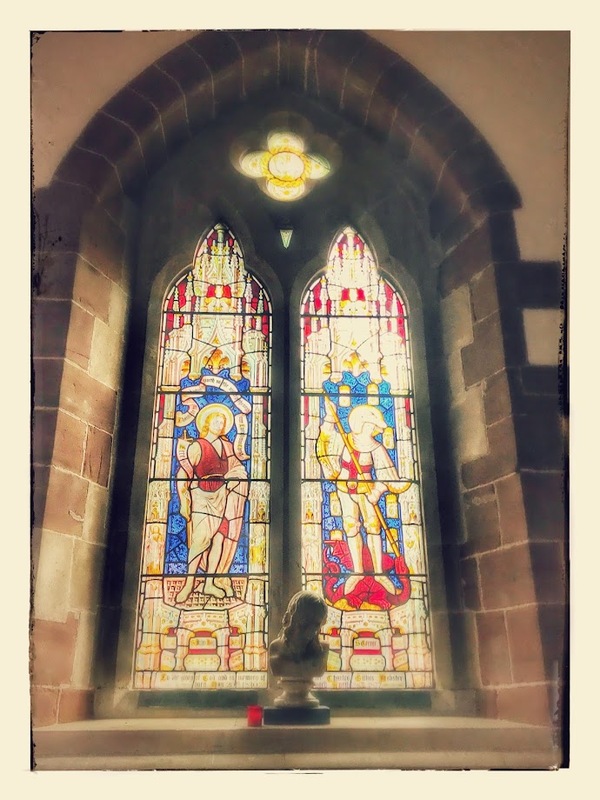 Of course there is also a two-light Kempe window in the Chapel of Saint John’s Hospital, Lichfield, showing Saint John the Baptist on the left and on Saint George the right. The best-known window in Saint John’s is John Piper’s striking East Window, ‘Christ in Majesty.’ This striking Resurrection image is Piper’s last major undertaking and it was executed by Patrick Reyntiens in 1984. But there are other windows in the chapel that are often overlooked and that are worth seeing, including one – if not two – windows by the Victorian stained glass designer and manufacturer Charles Eamer Kempe (1837-1907). Kempe was best known in the late Victorian period for his stained-glass windows, some of which can also be seen in Lichfield Cathedral. The Cambridge Church Historian Owen Chadwick, who died in 2015, has said his work represents ‘the Victorian zenith’ of church decoration and stained glass windows. His studios produced over 4,000 windows and designs for altars and altar frontals, furniture and furnishings, lichgates and memorials that helped to define a later 19th century Anglican style. Kempe studied architecture under George Frederick Bodley and then at the Clayton & Bell studio, where his first work was produced in 1865. He worked independently from 1866 into the 20th century, with his own workshop from 1869. The English cathedrals that display his work include Lichfield, as well as Chester, Gloucester, Hereford, Wells, Winchester and York. Kempe’s works in Lichfield Cathedral include the Lady Chapel altar and carved wooden reredos (1895). He designed half the windows in the cathedral, including: the Bishop Hacket Window (1901) in the South Quire Aisle, celebrating the completion of the Victorian restoration; the Barnabas Window (1898); Saint Stephen preaching to the Sanhedrin (1895); Saint Peter and Saint John healing (1894/1895); King David training the musicians (1890); ‘Self-Sacrifice’ in Saint Michael’s Chapel (1904); the imposing South Transept window, ‘The Spread of the Christian Church’ (1895); other windows depicting saints; the windows in the Chapel of Saint Chad’s Head; and some of the windows in the Chapter House. Nearby, in Christ Church, Leomansley, Kempe designed the glass for the north transept west window in 1894. In the chapel of Saint John’s, Kempe’s window on the south side depicts Saint John the Baptist and Saint George the Martyr. The window was commissioned as a memorial to Captain Peter Charles Gillies Webster (1830-1877), of Penns, near Sutton Coldfield, Adjutant of the Staffordshire Yeomanry. Surprisingly, despite Webster’s lifelong interest in genealogy and heraldry, there are no heraldic images on this window, nor could I see Kempe’s trademark golden wheatsheaf. Above Saint Philip is the coat-of-arms of the Bishops of Lichfield; above Bishop Smyth is his coat-of-arms as Bishop of Lichfield. Around Saint Philip’s head, a scroll reads: ‘We have found Jesus of Nazareth’ (see John 1: 45). Bishop Smyth is holding a crozier with his left hand and in his right hand he holds an illustration of the chapel. Above him, the words on a scroll read: ‘Except the Lord build the house’ (Psalm 127: 1). The image of Saint Philip was chosen because this window commemorates the Victorian Master of Saint John’s, the Revd Philip Hayman Dod (1810-1883), who carried out the repair and the rearrangement of this chapel in 1871. While he was Master and Warden of Saint John’s Hospital (1842-1883), Dod was also a minor canon or priest-vicar of Lichfield Cathedral. The largest window on the south wall of the chapel is the earliest stained glass window in Saint John’s and dates from around 1855. This window depicts Christ healing the crippled man at the pool of Bethesda (see John 5: 1-16). Between this and the Kempe window is a two-light window to commemorate Catherine Browne (1813-1880), depicting Christ with the children. The Biblical text in the lower window reads: ‘Suffer the little children to come unto me and forbid them not for of such is the kingdom of God’ (see Matthew 19: 14; Luke 18: 16; Mark 10; 14). The Friary site is a little north of Saint John’s and it a curious coincidence, given the Biblical theme in this window, that many years later her home become the site of the Friary School. Kempe was seen by his contemporaries as a Tractarian, but primarily he saw his task ‘to beautify the place in which to celebrate the glory of God.’ His window – or perhaps two windows – in the Chapel of Saint John’s offers or offer an interesting illustration of this principle.